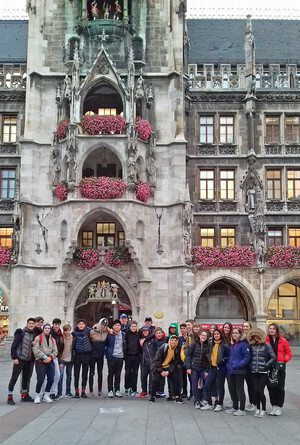 A group of Senior School pupils with an interest in German and/or History travelled to Munich at the start of the half term break. 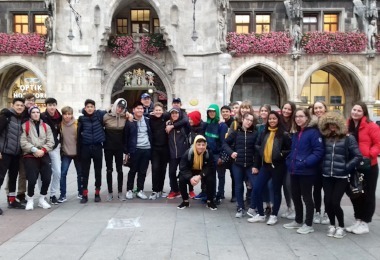 As well as being given a very enjoyable tour of the Allianz Stadium, visiting Schloss Nymphenburg and taking in the sights of central Munich, the group had the privilege of visiting Dachau Concentration Camp, led by their fantastic guide, Antje. 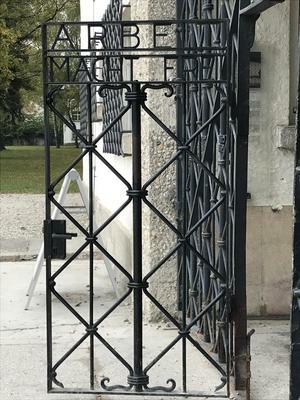 "On arrival at Dachau we were trying to get our bearings when we suddenly saw 'it' through the tree-lined barbed wire fence, one watchtower then another, then another. 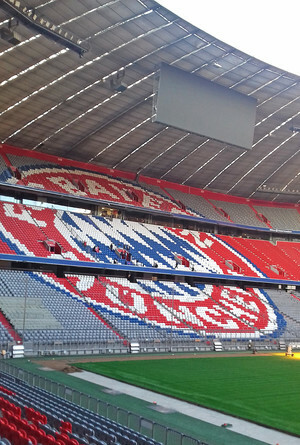 Your heart momentarily misses a beat. 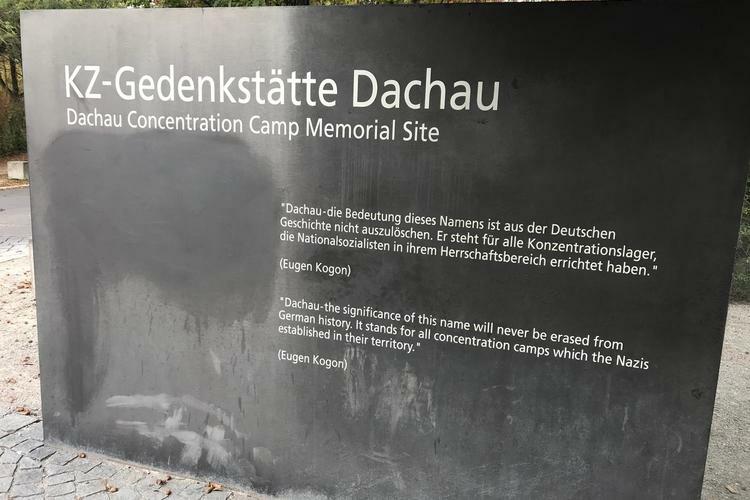 This was it, the first concentration camp in Germany, the model used by the Nazis to create all the others, even the ‘death camps’ later in WW2. This was the place where they started with political prisoners in 1933 and moved on to Jews, Jehovah’s Witnesses, homosexuals, gypsies until finally, during WW2 it housed Polish and Russian prisoners of war. 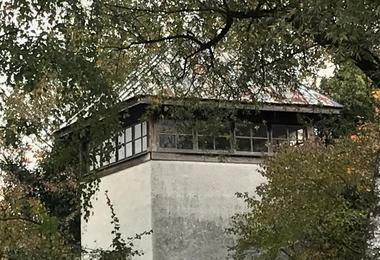 This is where they built an un-used gas chamber, disguised as showers, next to a crematoria which, thanks to the brutality of the SS, worked night and day. This is where they carried out hideous medical experiments as well as infamous tortures such as the ‘whipping horse’ and ‘pole hanging’. 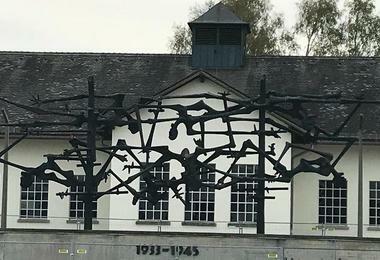 This is where they forced prisoners to work to death all day building German armaments, before keeping them standing to attention at evening roll call for up to 3 hours on end. This is where SOE agents were murdered, where the SA leaders were killed in the Night of the Long Knives, where Adolf Eichmann and Rudolph Hoess learned how to terrorise and execute... with all these thoughts swirling around our heads we walked through the entrance to Dachau known as the ‘Jour House’, through the gate with the cynical message ‘Arbeit Macht Frei’, all part of the propaganda designed to make German people think the camp was simply for 're-educating' anti-socials, and inside the enormous, desolate, grey camp known as Dachau." 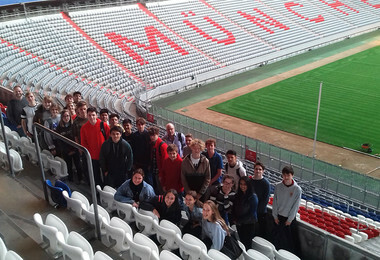 Mr Drury commented, "Students were humbled by the sights and places we saw: from the gates into the camp, to the gas chamber and crematoria, to the reconstructed barracks where a space designed for 54 men was occupied by as many as 400 – the atmosphere of the places was simultaneously poignant, chilling and emotionally draining." No doubt memories of the trip will stay with the pupils for a very long time.